For the park in Beverly Hills, Michigan, see Beverly Park Michigan. Not to be confused with Beverley Park, New South Wales. North Beverly Park as seen from a ridge overlooking it near San Ysidro Drive. Beverly Park, divided into North Beverly Park and South Beverly Park, is a gated community in Los Angeles, California. This wealthy neighborhood is primarily known for its concentration of large houses and for its famous residents. The communities carry a Beverly Hills Post Office address (90210 ZIP Code), but are located within the city of Los Angeles. The neighborhood is located between Mulholland Drive and Sunset Boulevard and Coldwater Canyon Drive and Beverly Glen Boulevard, east of the Beverly Glen neighborhood. North Beverly Park, with a main entrance at 13100 Mulholland Drive, is the larger 64-home section. South Beverly Park consists of 16 homes. Property covenants require that homes in Beverly Park be at least 5,000 square feet. As early as the 1960s, the area was under development as "a golf course and country club, named after Dean Martin." By 1979, developers Elliot Gottfurcht and Brian Adler, together with private investors, developed South Beverly Park as "an idyllic community of historic-feeling grand estates that would feel like Beverly Hills of yesteryear." The project was completed in 1990 as a 250-acre (100 ha) guard gated community. 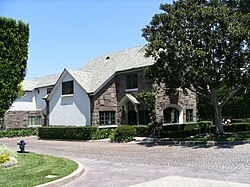 Adler used the concept of having gates to distinguish the neighborhood from other Westside neighborhoods of Beverly Hills, Holmby Hills, and Bel-Air. It originally contained 64 two-acre (0.8 ha) lots, a 4-acre (1.6 ha) landscaped park, and over 100 acres (40 ha) of open space; a number of adjacent lots have since been developed. Beverly Park is divided into two separate communities, one being North Beverly Park, the other South Beverly Park. North Beverly Park is a larger community and most homes there generally commanded much larger prices than homes of South Beverly Park. In May 2008, residents of South Beverly Park sued the North Beverly Park Homeowners Association over access to the north's two gates at Mulholland Drive after access was restricted in 2007. Residents of South Beverly Park could use the gate, but visitors were forced to use the south's gates, which, due to the location of the neighborhood, could require a detour of up to seven miles (11 km). The dispute arose in March 2006 when the north's Homeowners Association sent the south's homeowners a letter demanding that they "pay their fair share of costs we [the north association] are incurring for maintenance of the roads, gates, and security" for an amount specified at $121,000 a year. The south's residents rejected the demand, and a series of legal correspondence followed that resulted in the north's raising the amount it sought to $128,000. In May 2007, the north informed the south neighbors that their relatives, "staff, vendors, and guests" would no longer be allowed to enter the north's gates at Summitridge and Mulholland Drives. On January 13, 2009, Judge Norman P. Tarle ruled in favor of the South Beverly Park Homeowners Association, giving them the right to regain full use of the northern gates and their friends, guests, and vendors would no longer have to take the seven-mile detour. The North Beverly Park HOA later filed an appeal to the decision, but the judgment was affirmed. After their lawsuit was won, the South Beverly Park residents were awarded a post-judgment order by the court system, entitling them to compensation from the North's Homeowners' Association for attorney fees and costs totalling $826,926.13. The North Beverly Park HOA filed an appeal to this post-judgment order as well, but again lost when the judgment was affirmed in late 2011. This finally ended a nearly five-year legal battle. Despite being a gated community, there have been rare but occasional instances of crime. In February 2007, the Beverly Park home of Tim McGraw and Faith Hill was burglarized. Police stated that the method of entry was believed to be a broken window and an unspecified amount of money was missing. In February 2010, resident Lisa Vanderpump's automobile was stolen from her driveway during the night and driven off a nearby cliff. Former residents Robert and Jeannette Bisno claimed that their gardens had been toilet-papered, trampled, and strewn with debris in 2004, though there was speculation this may have been the doing of another resident(s), as the Bisnos were involved in a dispute with their Homeowners' Association over a sculpture at the time. Although not a crime, an incident occurred in June 2012, when the home at 50 Beverly Park Way (currently owned by Russian-Armenian businessman Albert Avdolyan) caught fire, requiring over 100 firefighters to contain the blaze and causing more than $1 million in damages. According to an LAFD spokesman, the fire was not arson and was accidentally started by a construction crew who were waterproofing the home at the time. ^ a b c Waxman, Sharon (July 2, 2006). "Paradise Bought in Los Angeles". The New York Times. Retrieved July 5, 2006. ^ Geist, Isabella (June 28, 2002). "Beverly Park Avenue". Forbes. Retrieved July 5, 2006. ^ a b c d e f g h i j k l m n o p q r s t u v w x y z aa ab Brennan, Morgan (September 2, 2013). "Inside North Beverly Park, Beverly Hills' Mansion-Packed Billionaire Community". Forbes. Retrieved August 17, 2014. ^ a b c d e f g h i j k l m n Groves, Martha (November 20, 2008). "Hollywood stars sue over access to a neighborhood gate". Los Angeles Times. Retrieved November 20, 2008. ^ a b Jackson, Candace (January 8, 2015). "L.A.'s Star-Studded Neighborhood: Denzel Washington, Sylvester Stallone, Mark Wahlberg and other red-carpet regulars call this ritzy enclave home". The Wall Street Journal. Retrieved January 13, 2016. ^ Chazanox, Mathis (November 12, 1989). "Developers Tailor $100 Book for Estate-of-the-Art Advertising : Beverly Park: Houses in an unfinished project below Mulholland Drive are ranked with elegant mansions". Los Angeles Times. 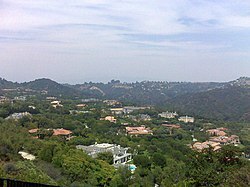 ^ "Beverly Hills Developer Offers Land and Dreams". The New York Times. October 7, 1984. ^ "South Beverly Park Homeowners Association, Inc. V. North Beverly Park Homeowners Association, Inc". Leagle.com. August 19, 2010. Retrieved September 11, 2017. ^ "South Beverly Park Homeowners Association, Inc. V. North Beverly Park Homeowners Association, Inc". Leagle.com. August 1, 2011. Retrieved September 11, 2017. ^ "Faith Hill, Tim McGraw's House Robbed". People. February 13, 2007. Retrieved September 11, 2017. ^ Miller, Leslie. "Bentley, Sheen's Mercedes found in ravine". ABC7 Los Angeles. Retrieved September 11, 2017. ^ "Beverly Hills mansion fire causes more than $1 million in damage to former 'Real Housewives' home". Los Angeles Daily News. June 30, 2012. Retrieved September 11, 2017. ^ Rohleder, Anna (January 5, 2001). "Eddie Murphy Meets His New Neighbors". Forbes. Retrieved July 5, 2006. ^ Smart, Gordon (October 11, 2008). "Let Me Entertain You in my £12m pad". The Sun. London. Archived from the original on October 30, 2013. Retrieved October 11, 2008. ^ Carpenter, Cassie (October 6, 2014). "Mark Wahlberg's 30,000 Square Foot Beverly Park Mansion". The Daily Mail. Retrieved October 6, 2014. ^ Beale, Lauren (December 1, 2010). "Norm Zada sells his Beverly Park compound". Los Angeles Times. Retrieved May 8, 2011. This page was last edited on 22 February 2019, at 05:07 (UTC).